When it comes to kitchen backsplashes, tile is easily one of the most popular options out there. It is a tried and tested material that lends itself well to the purpose of the backsplash. We’ve seen our fair share of tile backsplashes across the many kitchen projects we’ve done here at Key Residential, ranging from the classic types that feature subway or large set tile, to the more unique ones that include a mosaic pattern or are made from metal. Take a look at a few of our favorite kitchen tile backsplashes from projects past and perhaps get inspired for your own backsplash remodel. The new mosaic backsplash was one of the few changes made during this kitchen remodel, but it made a world of difference in the room, proving that a successful remodel does not always need to involve substantial changes. The small mosaic pattern adds some drama and a small amount of color to the kitchen. Installing the tile in a diagonal pattern gives it an elevated and high-end feel. Using both light and dark tones complements the two different countertop materials that were used in the room and ties the design of the room together well. 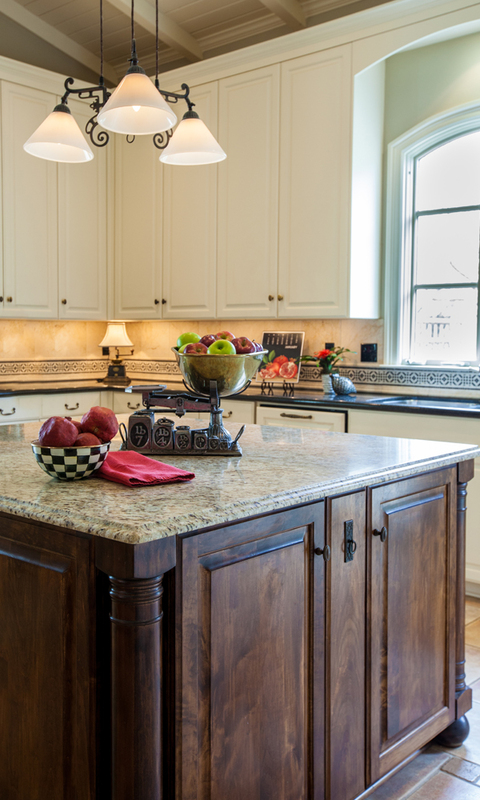 The focus of this kitchen remodel was in honoring the home’s historical legacy and as such has a strong influence of traditional design. But the arabesque tile used for the backsplash gives the room a unique design feature that breaks slightly with the traditional feel without feeling too out of place. The tile has a 3-D element to it that is heightened by the undercabinet lighting reflecting off its glossy finished surface. Choosing white as the color of the tile helps to tie it in to the predominantly white kitchen and not allow its uniqueness to feel out of place among all the traditional styled features of the room. Mosaic tile makes for a great backsplash choice when looking for a way to add some drama and uniqueness to the kitchen, especially when it is a smaller sized room. This outdoor kitchen is the perfect place to use a vivid and fun tile and pattern. The primarily green tile with hints of blues and browns provides a nice break from the heaviness of the brown tones in the wood cabinets and brick. The green tile also plays nicely with the nearby Big Green Egg. And since there isn’t a lot of space for the backsplash, the busy and colorful pattern does not overwhelm the space. Looking to add some boldness and drama to your kitchen? Why not go with a metallic backsplash tile like the one used in this North Dallas kitchen. Without the backsplash the kitchen has a rather standard appearance with quartz countertops and light wood finished cabinets. But the small square shaped mosaic metal tiles elevate the kitchen to a new level, giving it a special touch that is anything but ordinary. It also blends well with the stainless steel finished appliances and the knife and utensil holder magnetic strips that are mounted on the backsplash. There is a plethora of options when it comes to mosaic patterned tile. This kitchen features yet another version of the mosaic pattern with long, skinny strips of tile that alternate between a few coordinating colors. Contemporary styled kitchens, such as this one, are focused around clean simple lines that can sometimes come across as sterile and lacking in design. Choosing a busy, colorful tile backsplash helps this kitchen be anything but boring. It adds visual interest without becoming too overpowering within the simpler design elements of the room. 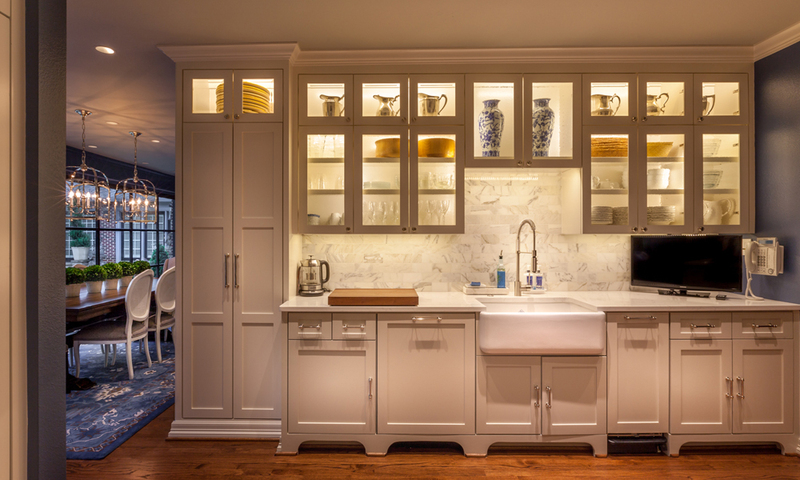 A more classical version of the tile backsplash was used in this traditional styled kitchen. The larger, neutral colored tiles give it a timeless appearance and is an ideal choice when creating a backsplash that will stay in style for as long as possible. But the backsplash avoids being boring or simple due to the inclusion of a strip of decorative tile just above the countertops. This tile adds some drama and interest to the backsplash so that it does not become an overlooked part of the room. This kitchen features a luxurious marble subway tile that fits in marvelously with the high end look and feel of the room. The lighter color of the tile allows it to blend well with the white cabinetry and marble countertops but also stand out against the darker blue of the walls. The tile is also used as a backsplash for buffet cabinets in the adjacent morning room and breakfast room and helps to visually tie the two spaces together. By using the standard subway pattern to install the tile the marble nature of the tile can shine. From a distance it almost looks like it could be one solid piece of stone. Metallic tile was also used in this kitchen, but this time instead of a mosaic pattern subway tile was used, proving the versatility of the uncommon material across all shapes and sizes. The tile is a goof complement for the kitchen’s modern design style which often favors clean, simple lines and the use of more unique materials like metal. The tile’s reflective and shiny nature fits in well with the glazed finish of the kitchen’s cabinetry and helps reflect the task lighting, especially when the purple accent lights are on.